The Funny Thing about Artificial Sweeteners . . .
What many people don’t realize about artificial sweeteners is that they don’t help you lose weight! They actually feed or catalyze your sweet tooth, making you crave MORE sugar rather than less. There is also evidence that they slow down digestion and increase appetite. Sucralose, which is found in many sweeteners, including Splenda, has been linked to accelerating or causing migraines, mood and sleep disturbances, dizziness, fuzzy thinking, and an inability to concentrate. Sweeteners such as aspartame, found in Nutrasweet and Equal, can also create a fun little thing called “excititoxicity,” which stimulates the brain in less than positive ways, and can also lead to neurological and endocrine problems and can even be addictive. · Xylitol has a small glycemic index, but it is still 20 times less than sugar. It is being used all over the world as a safe choice for diabetics. 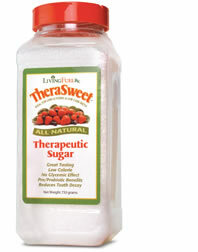 · Tagatose is a low-calorie sweetener which, unlike most substitute sweeteners, withstands the heat of baking without breaking down, and it browns like sugar. 6. Lowering intestinal pH by the production of lactic acid, creating an environment unsuitable for pathogens. · We’ve also added glycine, an amino acid found in the protein of all life forms. Glycine is required for the maintenance of the central nervous system and is an important neuroinhibitor (brain relaxant). It also plays an important role in the immune system, where it is used in the synthesis of other non-essential amino acids. Glycine is also a constituent of a vital bile acid, and together with cysteine and glutamic acid, makes up glutathione—a major liver detoxifier and a quencher of free-radicals.